The Peak Tramways Company has several times aspired to expand its operations. 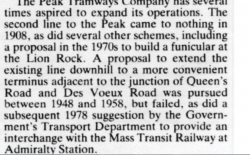 The second line to the Peak came to nothing in 1908, as did several other schemes, including a proposal in the 1970s to build a funicular at the Lion Rock. 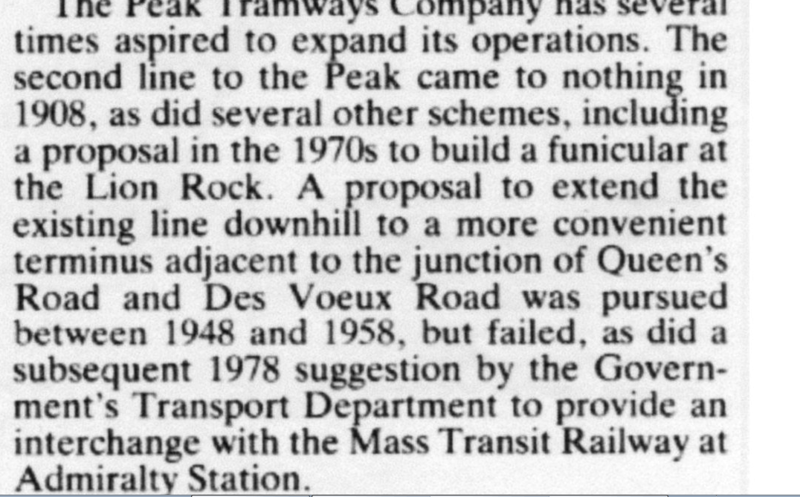 A proposal to extend the existing line downhill to a more convenient terminus adjacent to the junction of Queen’s Road and Des Voeux Road was pursued between 1948 and 1958, but failed, as did a subsequent 1978 suggestion by the Government’s Transport Department to provide an interchange with the Mass Transit Railway at Admiralty Station.